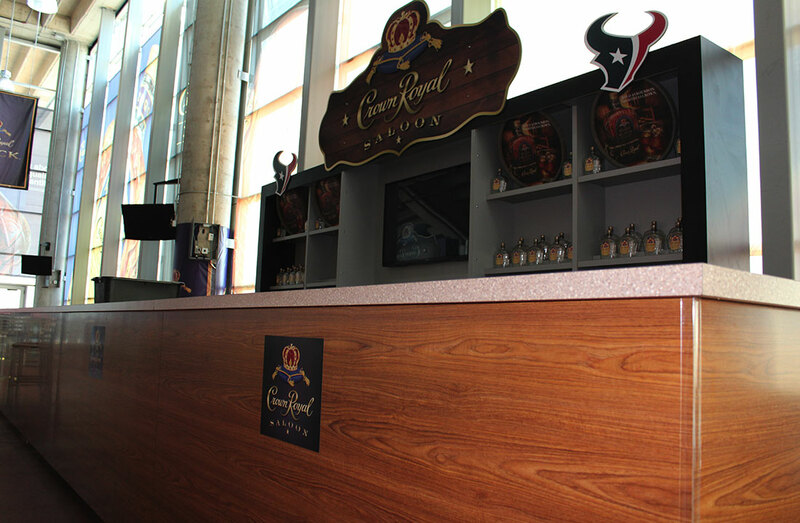 As the NFL's Houston Texans were busy gearing up and training for yet another dynamic and exciting fall season, the 2020 Exhibits team was hard at work drafting their very own game plan for one of the team's iconic luxury brand partners, Crown Royal. 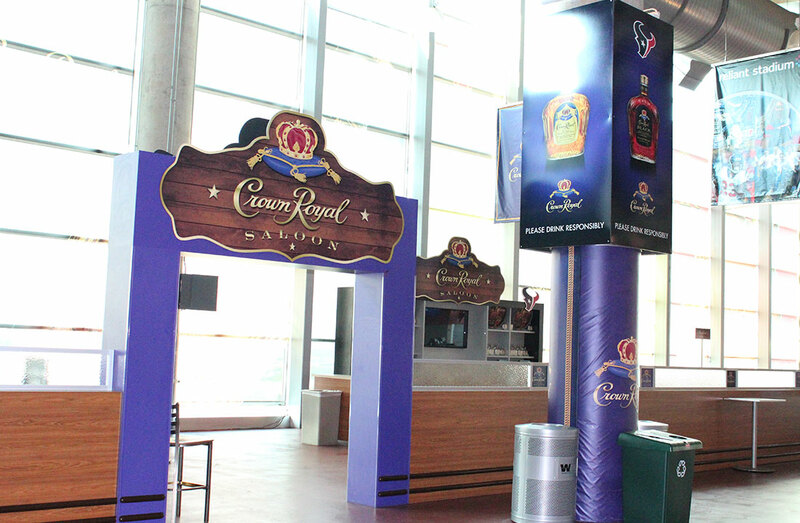 With a pre-existing venue located on the south concourse of Reliant Stadium, Crown Royal turned to 2020 Exhibits to help refresh this space and create an environment that would enhance the game-day experience, capturing the feel and flavor of this iconic brand, and offer passionate fans a place to kick back, have a sip of their favorite beverage and enjoy the game. Drawing on inspiration from the rich Crown Royal imagery, the 2020 Exhibits Team huddled to draft the perfect game plan for a semi-permanent installation. Focusing on a crisp, clean and vibrant design that would artfully include the iconic and elegantly scripted Crown Royal word mark and the Crown & Pillow, across a variety of mediums, 2020 Exhibits scored big delivering a fully rebranded, refreshed and totally new Crown Royal Saloon. How did 2020 Exhibits design a space that that would draw fans in, making them feel comfortable and right at home? From top to bottom and inside and out, the Crown Royal Saloon space was maximized, concentrating on a smooth, easy flow -- much like Crown Royal. 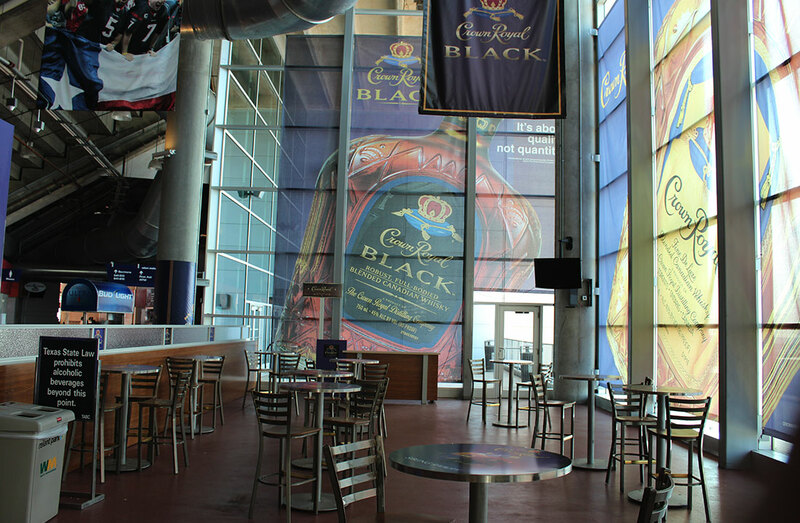 As the #1 market in the country for the popular Crown Royal regular and Crown Royal black brands, 2020 Exhibits' design celebrated the spirit of these two extraordinary brands with creative, inviting messaging and graphics. 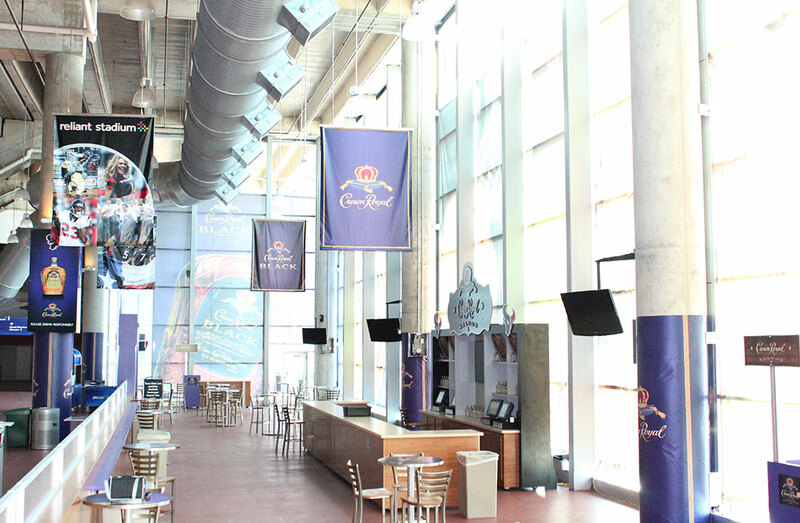 From fabric column wraps to frosted glass dividers, 2020 Exhibits focused on luxury throughout the almost 4,000 square foot space, maximizing the color and style that is as unique and memorable as the Crown Royal brand. 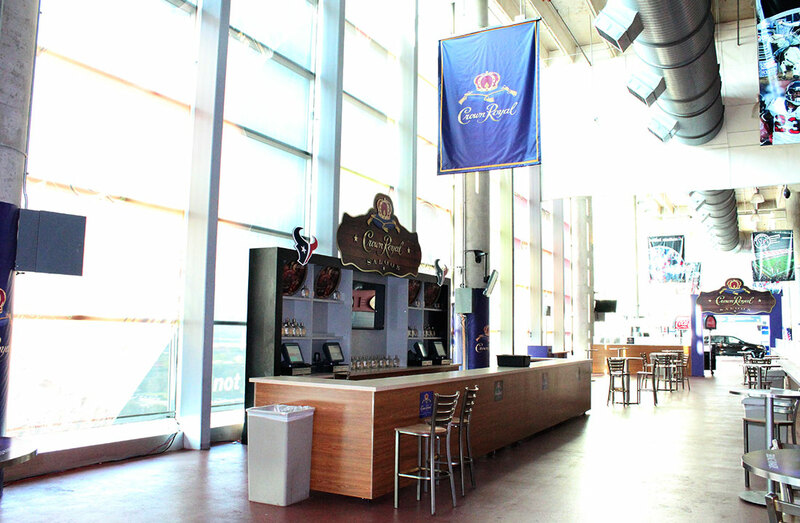 Open to all ticket holders, the Crown Royal Saloon's grand arched entrance offers the perfect blend of color and form, welcoming fans to an open yet intimate space. Designed to withstand the heavy traffic flow of a half time crowd, the Crown Royal Saloon is polished yet nearly indestructible, engineered to break down for easy storage during the off season. A wood grain, wrap-around counter establishes a sense of privacy with curved, branded bistro tables and highly polished chrome stools scattered throughout. 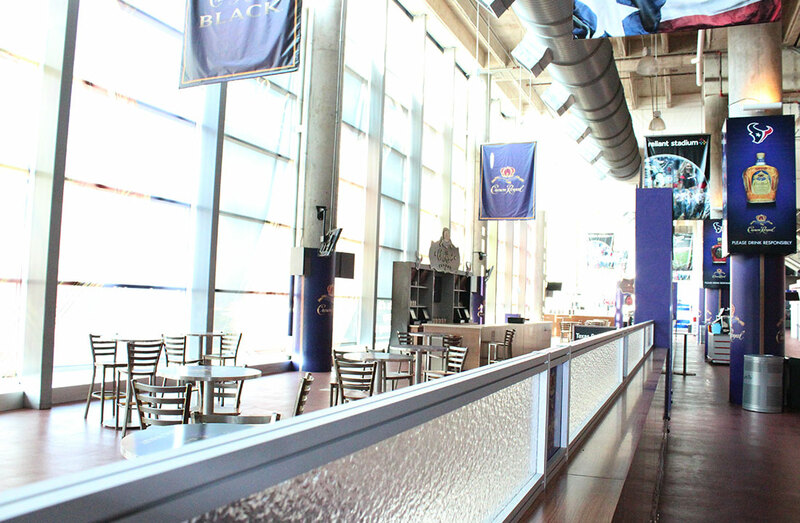 Vivid imagery attracts and invites from across the concourse as Crown Royal's signature crown-shaped bottle and deep purple bag – detailed all the way down to the stitching -- is boldly featured on column wraps and banners surrounding the Saloon. 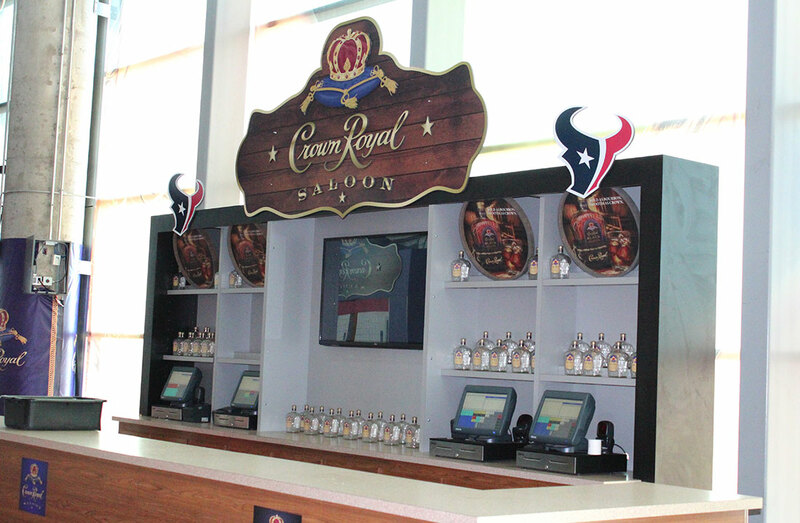 Focusing on hospitality and key brand touch points, multiple screens broadcasting the Texans game are strategically placed throughout the Saloon. 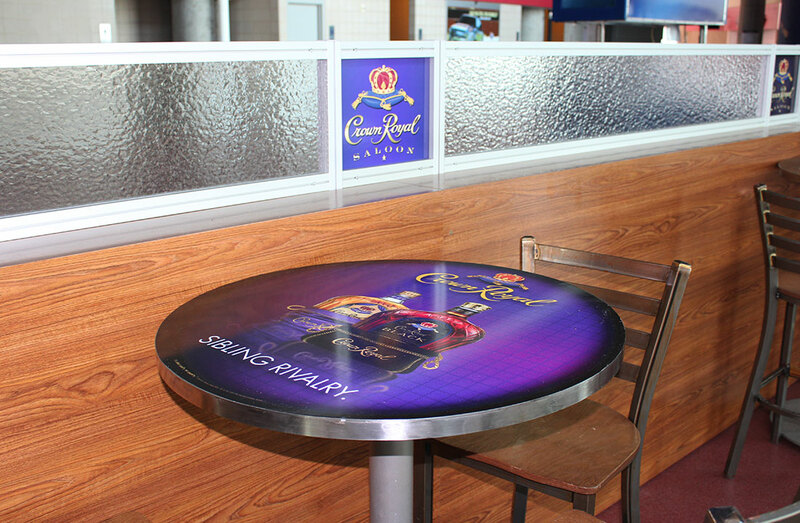 Through the creative use of the brand's signature colors and iconic branding, 2020 Exhibits helped Crown Royal differentiate itself, with a highly visual, memorable experience that is solid, enduring and Crown Royal smooth. Welcome to the Crown Royal Saloon.